Here’s another entrant to the portable backup battery market, this one from Korean company Misemet. 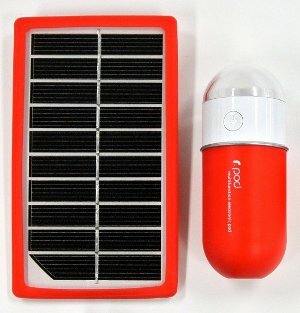 There are a couple of quirks to this one that makes it stand out: it comes with a solar panel to charge the battery pod, and the pod itself contains an LED flashlight. Yup, the flashlight part is definitely quirky. Both pod and panel come in one of three colors, green, red or yellow, and the panel is wrapped in a soft silicon case for protection and texture. There is also a similar cap for the lightbulb portion of the pod that protects the glass and also creates a mood light effect. Now the r.pod is hardly meant to be stuffed easily into your backpack or your shirt pocket, as it not only weighs over 1/3 lb (6.3 oz) but it’s as large as a medium-sized vitamin bottle and coincidentally shaped like a large capsule pill. On the plus side, it contains a 4000mAh lithium-polymer battery, good enough to charge up your cell phone a couple of times or your iPad/tablet once. 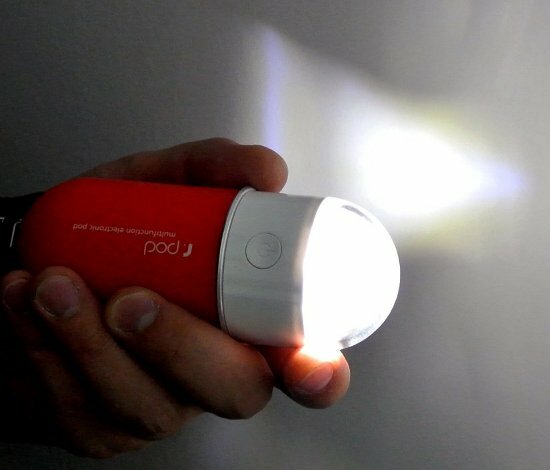 To charge up the r.pod fully requires at least 12 hours of direct sunlight which can be slow going for many of us, especially if you’ve had a lot of gloomy weather. 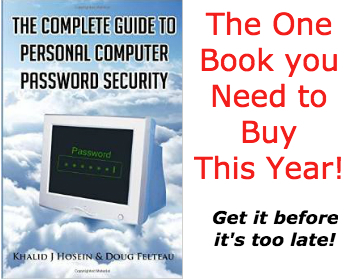 However, you can charge it up directly via its accompanying USB cable plugged into your favorite USB connector. And naturally, the r.pod has an output USB connector that you would then use to plug into your device (smartphone/tablet/game/etc.) to charge them up. Inside the flashlight housing, there are 6 distinct LED lights as well as a smaller charging/discharging indicator that cleverly lights up from red to yellow to green when charging and in reverse when discharging (i.e. charging up another device). Now Misemet obviously had outdoors folks in mind as the r.pod not only comes with a pull-out clip for attaching a carabiner or other clip, but comes with a little carabiner as well. The flashlight is a 170 Lumen LED lamp that’s rated at 18 hours of lighting on a single charge. No, I didn’t test that! The r.pod charged up my phone just fine, but I found that it took roughly twice as long as charging directly from my wall adapter. But when you consider what the typical environment that you’d be using this in, that’s not too bad. You can pick up the r.pod for about $70 to $100.